Summary: Why is so much of America burning? We see the answer as much of California burns. Land was stripped of the trees that provided firebreaks, homes were carelessly built in natural fire zones, and decades of fire suppression allowed accumulation of tinder (details here). Scientists warned and were ignored. Here is an account of the next frontier in forest management. Ecologists’ research produces new recommendations — and anti-science greens stage political protests to stop them. It is a story of America’s failure to learn, of America the dysfunctional — because we have dropped the reins. By Warren Cornwall at Science, 6 Oct 2017. Links and color emphasis added. The money paragraphs are at the end. Work of an eminent scientist. “In …1969, while working as a U.S. Forest Service scientist in Oregon, Franklin …and his colleagues uncovered a rich and intricate world, in which ancient trees nourished new life with fallen logs, cleansed salmon-filled streams, and provided habitat for a menagerie of life, including lichens, rodents, and owls. “As that picture coalesced in the 1970s, it coincided with the stirrings of opposition to the logging industry that relied on old-growth forests. The so-called ‘Timber Wars’ of the 1980s and early ’90s pitted environmentalists wielding lawsuits and civil disobedience against federal officials and timber firms. Efforts to protect the northern spotted owl, an old-growth denizen, became a centerpiece of the conservation campaign … Franklin’s scientific work backed a broader argument: that logging was dismantling the foundations of a vibrant ecosystem that nurtured far more than just the owl. “It essentially halted logging in federally owned old-growth forests — generally defined as having trees older than 180 years — on federal lands. It also protected 4 million hectares of mixed old-growth and previously logged lands. The amount of wood coming out of federal forests fell from nearly 12 million cubic meters per year in the late 1980s to a 10th of that in recent years. As the saws went silent, many small mill towns withered. The next generation of research about forest management. The paper is “The forgotten stage of forest succession: early-successional ecosystems on forest sites” by Mark E Swanson and Jerry F. Franklin et al. in Frontiers in Ecology and the Environment, March 2011. It concerns the vital role of early seral landscapes in forests (a kind of seral community). For an introduction see “The forgotten forest” by Tim Steury in Washington State Magazine. A follow-up paper is “A Restoration Framework for Federal Forests in the Pacific Northwest” by Jerry F. Franklin and K. Norman Johnson in the Journal of Forestry, December 2012. See this graphic from the Science article (click to enlarge). The greens respond to science. “The debate has grown more charged as Franklin has turned his ideas into on-the-ground action. In 2013, after Franklin and Johnson teamed up with the federal Bureau of Land Management (BLM) for a small logging experiment near Roseburg, Oregon, protesters camped out for months among the limbs of the largest trees — some a century old — to block the project. Two years later, a federal judge sided with the opponents, ruling BLM hadn’t fully studied the environmental impacts. Johnson and Franklin wrote an op-ed in the Register-Guard explaining that the billboard was inaccurate. As if the greens care about the facts, or science. This is an example on a small scale (so far, at least) of scientists attacked by political activists on the left. No matter that the left previously lionized them. No matter how eminent the scientists, how distinguished their work, or how well-founded the research — the protests begin if it contradicts their ideology. Science “denial” is a phenomenon on both the Left and the Right. Larger examples are the jihads against Professor Roger Pielke Jr. (here, here, and here), Roger Pielke Sr., and Dr. Judith Curry. (Science deniers on the far right are less active; the right’s energy goes to attacking doctors who do abortions). This problem appears to be growing worse, as greens become increasingly active against science whose conclusions they do not like — as the left becomes increasingly active on colleges suppressing speech they do not like (recent examples: calls to fire Professor Scott Yenor at Boise State U). and professor Bret Weinstein at Evergreen State College). We depend on science to help us manage an increasingly complex world. Rapid progress is our best hope to avoid the dystopian scenarios that Hollywood shows us for the 21st century. That will not happen if we listen to political activists attacking science that does not fit their ideology. Do you subscribe to Science? If you are reading this, you probably would find it interesting and useful. Subscribe here. In 2004 the Society for Conservation Biology gave him its Edward T. LaRoe III Memorial Award. “Given to an individual who has been a leader in translating principles of conservation biology into real-world conservation. In 2005 he received the Heinz Award for the environment. In 2016 the Pinchot Institute for Conservation awarded him its Pinchot Medallion, which honors “an individual who has made extraordinary and valuable contributions to science or practice in environmental conservation and sustainable natural resources management.” The award is named for Gifford Pinchot, the first leader of the U.S. Forest Service and an advocate for conservation. The Ecological Society of America named name him its “Eminent Ecologist” of 2016. It honors an ecologist who has made significant, long-standing contributions to the field of ecology. Good news about polar bears, thriving as the arctic warms! Good news about CO2 emissions. Progress to a better world. Cut thru the myths about Irma, Harvey, and climate change. A tale of America’s mismanagement of its natural areas, ignoring scientists. by Alston Chase tells the story about our generations of mismanagement of Yellowstone Park, jewel of the National Park system. Recommendations by scientists were frequently ignored — resulting in waves of well-intentioned slaughter of wildlife and a distorted ecosystem. Chase was chairman of the Department of Philosophy at Macalester College in Minnesota, with degrees from Harvard, Oxford and Princeton Universities. He has written incisive books on several subjects..
Reblogged this on HiFast News Feed. The fluidity of gender is another example of an activist political ideology not agreeing with science. Yes. That is the story of the article I linked to about Professor Scott Yenor — attacked for his remarks about the transgendered rights campaign. The Left was remarkably successful in Washington state in destroying logging as well as saw-milling towns. They mainly used the spotted owl. Jobs and communities were destroyed to “save” the owl. Very few spotted owls in the logging areas of southern British Columbia. The Left did not destroy the equivalent communities in BC. It would have made more sense to keep logging and prosperity going. The habitat of the sacred owl would have moved a few hundred miles south. Only until the forests had been restored by tree planting. Perhaps so. It’s not a subject about which I know much. Clear cutting seems to me, based on the tiny amount I know, to be ecologically unwise. My guess (guess) is that the Left used the endangered species law as a hammer to stop clear-cutting in the absence of any more rational tool. 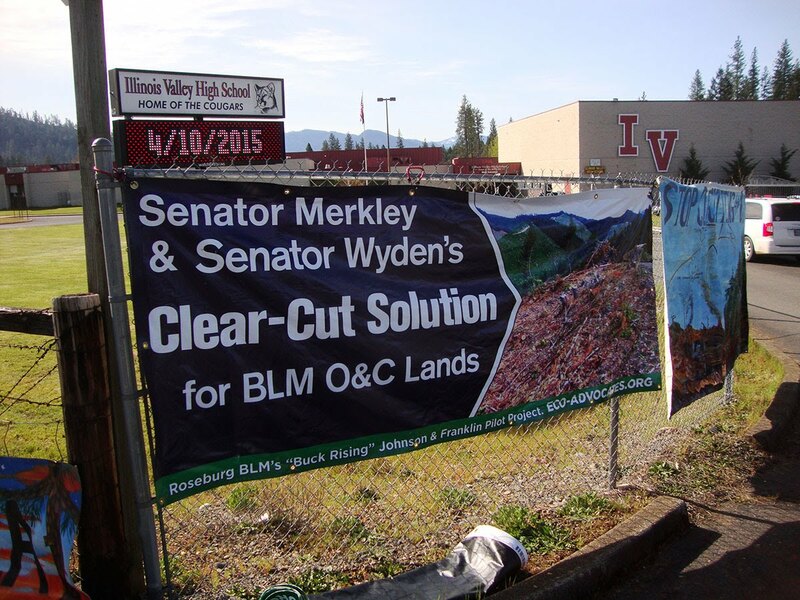 There has been a lot of negative press lately regarding the practice of clearcutting. It can be a very emotional issue because of perceptions that it causes environmental damage. However, most of these perceptions are not true. The principal objective of clearcutting is to regenerate the forest with healthier trees, not to harvest timber. Timber harvesting is a secondary objective. In a true clearcut, all of the trees greater than two inches in diameter are cut (as opposed to a commercial clearcut, where only marketable trees are removed). Clearcutting is especially useful in regenerating shade-intolerant species such as black cherry, which is highly valuable and needs full sunlight for optimum development. The practice actually mimics openings that tornadoes and fires create naturally. Clearcutting does not cause soil erosion. That is caused by poorly laid out road systems, whether the forest is clearcut or partially cut. Clearcutting can be done without significant erosion or sedimentation if roads are planned and built correctly using accepted best management practices (BMP’s) to protect streams. Logging companies do not clearcut just because it is the most economical way to harvest timber. In fact, it does not save them money. Many loggers dislike clearcutting because it forces them to spend time and money cutting trees they have no use for. Trees smaller than ten inches in diameter are often stunted, poorly formed, genetically inferior trees that are just as old as the larger trees but have no chance of ever growing large themselves, no matter how old they get. It is best not to leave them behind as residual trees taking up space, sun, and nutrients that high-quality trees could use. Clearcutting is ugly (one true perception). Diameter-limit cutting, which is cutting all trees over a selected diameter such as 14” (often called “select cutting” or “highgrading”) leaves a lot of trees in the woods and can look better than a clearcut, but it degrades the long-term health of the forest because it does nothing to clear away the small, elderly, slow-growing “junk” trees. Clearcuts can be very beneficial to wildlife. New openings grow very quickly into small trees and berry-and seed-producing shrubs, which provide both food and shelter for wildlife. Clearcutting increases the biological diversity of the forest, which enhances habitat for a variety of wildlife. Some species of wildlife actually thrive better in brushy thickets of seedlings and small saplings. Clearcutting is not deforestation. Clearcuts usually regenerate initially into dense thickets with thousands of tree seedlings per acre. Then they gradually thin out as the stronger trees show dominance and crowd out the weaker trees. Most of the forested hillsides that surround us in western Pennsylvania originated as clearcuts in the early part of the last century. Is clearcutting always the best way to regenerate the forest? No, but it is the best in certain situations, especially if advanced regeneration (many healthy seedlings) is present. It then allows the forest to start over, usually with the fastest, healthiest, genetically superior trees outcompeting their slower-growing companions. Of course, clearcutting is not the only way to regenerate a forest. Other traditional and effective silvicultural methods include the seed tree, shelterwood, and selection methods. As long as a clearcut is carried out using proper erosion practices and sound forestry principles, it is consistent with sustainable forest management. Great article and comments! Coexisting with nature is a delicate balance for humans. Smart humans will put a great deal of thought and study into the enterprise. We understand that Jerry Brown’s state government will reject the science in favor of green dogma. Other governments may slowly take heed. When I was in grade school, I remember getting a book out of the school library called The Universe Of Galileo And Newton. Among other things, it told how Galileo had been persecuted by the Church for attacking the officially approved version of physics, which happened to be completely wrong. And I remember thinking that we were so much more advanced now, because scientists were no longer persecuted of doing actual experiment and observation, and for trying to get at the truth. That was how it looked back then. Now I’m all growed up, and we’re moving backwards. I find it deeply depressing, and more than little scary. Well, that’s not really correct. Your comment is more accurate. We move forward, then slid back a little. That’s ok so long as we recover and push forward again! According to a professor I knew who studied the issue closely, the spotted owl became a dual-purpose mascot / scapegoat that was used in an opportunistic and rather disingenuous fashion by both timber companies and environmental activists. The environmental activists were happy to put all their chips on the spotted owl once it became clear that seeking relief under the Endangered Species Act was the best short-term path to legally blocking old-growth logging, even though spotted owl habitat was, itself, only a small part of the motivation for trying to save the old-growth and the science justifying it on that basis was pretty muddled. But the hidden part of the story is that these timber wars happened around the same time that most of the prime, easily-accessible old-growth tracts on federal land (taxpayer subsidized, natch) had already been, or were about to be, logged off. The timber companies were running out of top-tier inventory and knew that the easy-money salad days were coming to an end anyway, environmental activists or no. So they were happy to blame the mill shutdowns and resulting economic devastation on the damn hippy environmentalist outside agitators instead of becoming the targets of wrath themselves. So in the end this formed the basis of a compromise that both sides could live with, and that did protect a lot of what remained, but the public perception of it is a bit inaccurate. Now that is a cynical story! It also sounds correct (that would have been a smart play by the logging corps). I’d like to see some supporting docs on this. 1. The history of the timber industry in the U.S., which to a large extent is one of sleazy robber baron capitalism and rapacious extractive practices in a boom / bust pattern, clearcutting and moving on from the east coast to the the upper Midwest / Great Lakes region to the Pacific Northwest, and by the 1990s already transitioning to softwood plantations in the Southeast. 2. The use of the Endangered Species Act as a legal lever by environmental groups (because of its outsized power), often leading to successful but distorted campaigns to preserve places based not on their ecological importance but on the habitat of a single, usually small and obscure, species, which necessarily becomes the face of the campaign as well as a target of public opprobrium. 3. The gradual but steady decline in employment in the timber industry since WWII even as output increased as a result of improving technology and automation. 4. The housing boom and accompanying increases in timber harvests in the decade prior to 1990, followed by a real estate crash and recession. 5. The increase in overseas export of unfinished logs, diverting them from the value-added stream of milling and processing, further reducing workforce requirements. 6. The propaganda campaigns conducted by the timber companies blaming environmental concerns for job losses both internally (uniting workers and communities against the environmentalists) and externally with respect to the general public. The missing pieces, though are the figures for inventory levels on private and federal lands, the fraction of easily-extractable old growth and their economic value, etc. that would help determine how much longer the logging industry could have maintained the 1980s harvest rate and employment levels even in the absence of spotted owl protections. I recall the professor in question making a strong case here, and there is a vast amount of such data available to the public, but it requires some industry-specific technical knowledge to access, parse and digest it, and I’ve been unable to find a lay summary that addresses this specific angle. Did the spotted owl protections cost jobs in the short term? Certainly. In the strong form of the argument in question here, were timber companies happy to leave timber on the ground in order to avoid bad press from an inevitable industry slowdown? I don’t think so, judging by behavior in similar situations they’d be happy to suffer the worst sort PR in exchange for wringing every last nickel of value out of their operations. In the weaker form, were companies willing to accept the Northwest Forest Plan once it became clear that some regulation was inevitable, that there wasn’t much value left on USFS lands anyway, and that it provided a convenient scapegoat? Almost certainly. I assume you are smart enough to know that a comment like the one in the parent would get a response. Seems like it’s just a cheap shot, and doesn’t apply to the debate at hand. Seems like a relevant fact to me. Both Left and Right have largely abandoned normal methods of dealing with these kind of issues — and resorted to alternative means of resolving them. It’s important to realize that there are no angels on America’s extremes today. I began thinking about your article again because it focused strictly on logging. But there are other industries that harvest trees. Many years ago I was employed by the International Paper Co. At that time it was the 2nd largest landowner in the US behind the Federal government. Since then they have divested all of their land holdings. The reason I bring this up is that unlike the ecological reasons for “selective” clear-cutting by the logging industry, clear-cutting for paper manufacturing uses every tree no matter the size or age. So their clear-cutting is indeed the removal of all trees. Thanks for the explanation! Understanding that history is necessary to know the origin of the “spotted owl” battles. The lumber cutters were unwilling to compromise, and so fought until they lost big-time. I can understand why big companies try to cultivate this helpless, “we have to love the boss” sentiment in their workforce, but I am mystified as to why rural Americans in extractive industries seem to have fallen for it lately. Their forebears sure didn’t. Maybe they just don’t advertise about the lumberjack’s union or what-have-you. I don’t understand. What have workers in rural America fallen for? One of the factors that intrigues me is the different expectations for East and West. In the continental West, a huge percentage of the land is owned by some government, especially in Nevada. It belongs to us. So naturally we have free opinions. In the East, that just isn’t something we think about, since nearly all the land is privately owned. (Yes, I have been in some exceptions like Arcadia, the Blue Mountains, and the bayous). And in Europe it’s hard to find any non-mountain land that hasn’t been privately owned and managed for centuries. How many national parks do you think Germany has? So some of this is the private-ownership districts keeping the far-away public-ownership districts from managing things the way the locals see they need to be done. I wonder about the extent to which that is true. In New York, where grew up (later working in NYC), 69% of the land is forest (something most people find astonishing). Of that 19 million acres, 26% is owned by public entities. Details here; more details at Wikipedia. You might be thinking of just Federal land ownership, which is low in the eastern states. With some exceptions: the Feds own 14% of New Hampshire. But state and local entities are also big owners in the East. NH is the second most heavily forested state (behind Maine); 20% of its forests are owned by public entities (details here). In Virginia, 15% of the forests are publicly owned (details here): 12% Federal, 3% state and local. Most of the world’s forests are owned by public entities (not private). Yes, the CA (and many other western) forests have been mismanaged. In parts of them the building has been done in fire prone areas as you say. The forest management experts can easily quote for you the amount of fuel in the forest after a survey. It’s probably known everywhere in the country. I guess the “greens” are somewhat responsible for the situation, but it seems a “natural” result of “human nature”. If a few people build somewhere it won’t cause a big problem- the fire will be small. If you build what they have/had in the Oakland, CA hills, you have something with a completely different scale. There probably is a reasonable way to bring this situation into control, but it has two big costs: financial (to manage the “wild forests”- clearing, controlled burns, etc.) and “aesthetic” (also a financial impact? )- in places where there is human activity among the fire prone forest, you have to clear, etc. That partially destroys the whole reason why people wanted to build there in the first place. The 20thC fire suppression policy had broad support. Building in fire areas had and has broad support. What was the “greens” role? That can probably be said of most bad policy decisions. I wondered about that, but couldn’t find any analysis. Fire suppression isn’t cheap, either. Especially adding in the cost of the inevitable resulting mega-fires. It would require a well-funded project to compare the long-term costs of both management policies.